After my disappointment at Peeping Santa, I decided to pick one of the other Christmas bubble bars to try. 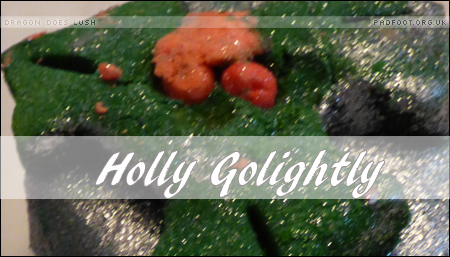 I’m not really a huge fan of glitter, but Holly Golightly looked nicely Christmassy and I took the plunge. Like Peeping Santa, this is a pretty firm bubble bar, which really doesn’t want to be broken up! Eventually breaking through the silver glittery exterior, reveals a Christmas-tree-coloured centre, which was a surprise given the silver on the outside. 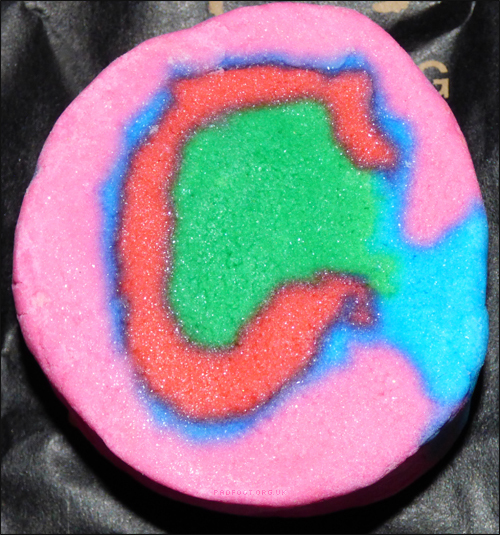 This is quite a strong scented spicy bubble bar, so I didn’t use much at all – the aroma softened in the water, making it strong enough to be able to identify, without being so strong that it made me sneeze. Holly Golightly is pretty generous with the bubbles too, even from using such a small piece, which should mean this £4.95 bubble bar will last for a nice number of baths, making it very good value for money when compared to the one-use Christmas bath bombs. 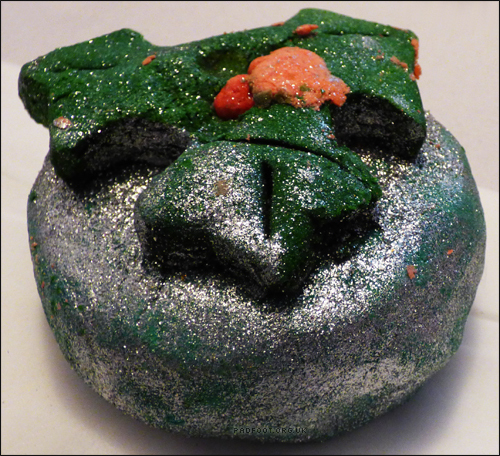 This entry was posted in Bubble Bars and tagged Christmas 2015, Spice scent on November 26, 2015 by Dragon. 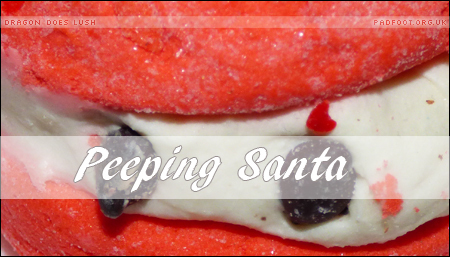 The first thing that struck me about Peeping Santa was the cute appearance of it – shaped like a bubbleroon, but with a Santa hat and eyes.I had high hopes for this little bubble bar. It’s not the easiest of bubble bars to break apart – rather than using the entire base in one go, I prefer to use smaller pieces to make it last longer, and that proved challenging to get a smallish piece to separate! 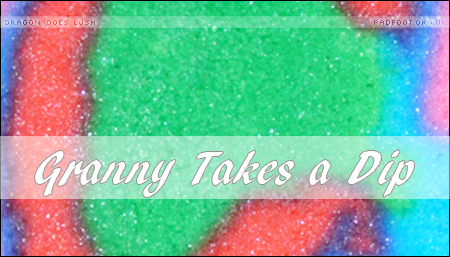 Even though I only used a small piece, there were plenty of bubbles – I have a feeling that if I’d used the entire base, the bubbles would have been flowing over the edge of the bathtub! The creamy-coloured centre of the bubble bar is shea butter, which should be a nice way of hydrating my skin while taking a bath. However for me, the aroma of this particular bubble bar was a let down. Rather than being scented of orange (like Dashing Santa), or cinnamon and spices (like Holly Golightly), this particular bubble bar smells of strawberries. Yes, you read that right, this very obviously Christmas bubble bar, smells of that spring / summer fruit, strawberries. I’m not too sure why Lush thought of strawberries for a Christmas product, but it’s not the first scent that comes to my mind for this time of year. So, it’s not a product I’ll be purchasing again, and I’ll be hoping that next year Lush might have a more wintry scent on a cute bubble bar instead! 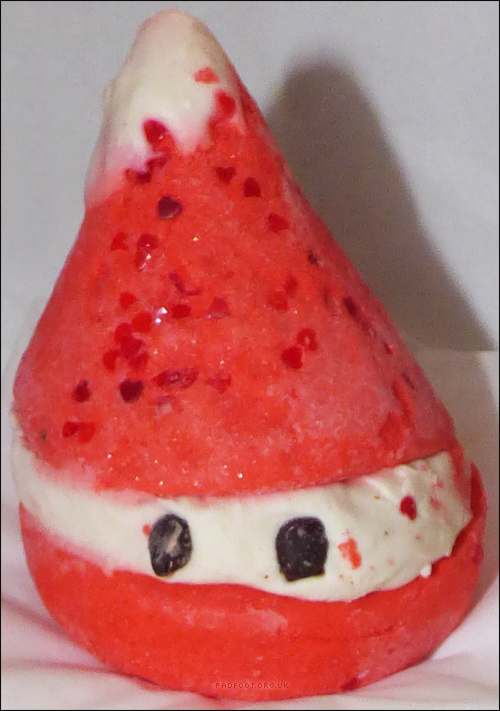 This entry was posted in Bubble Bars and tagged Strawberry scented on November 19, 2015 by Dragon. I’d never used the Granny Takes a Dip bath bomb, so when the new bubble bar appeared in store, I was keen to try it out. The first batch in the store had a very lime green colouring to the middle, but mine is a darker green which I prefer. Granny Takes a Dip hasn’t got a particularly strong scent – in fact I could barely make out any aroma at all from mine. Maybe that’s just down to my nose not being particular receptive, or maybe this came from a batch that just had less perfume to it. It’s meant to be ginger, pepper and lemon scented, and once crumbled into the water, I was able to pick out the lemon in there although it’s not anywhere near as lemony as Refresher! I used a small piece off the side of the bubble bar (part pink and part blue), and the water didn’t change colour at all. 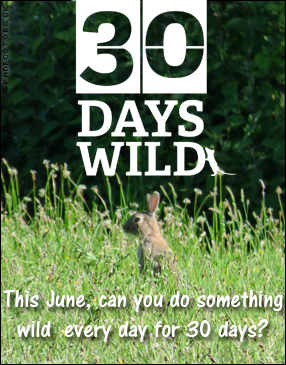 For me, that’s not a disadvantage – I don’t always like the water to take on a vibrant shade when I have a bath. 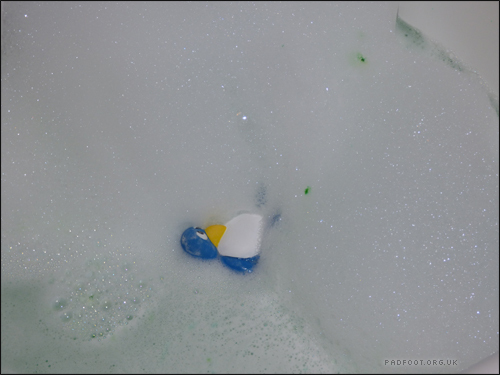 There were mountains of bubbles, even just from that small piece, so if I’d used half of the bar in one go, the bubbles would’ve been flowing out of the bath! Even after I’d used the shower jelly and washed my hair, there were some bubbles remaining – these seemed to last much longer than those from the Comforter. This entry was posted in Bubble Bars and tagged black pepper oil, ginger oil, lemon oil on September 10, 2015 by Dragon.